The Audi. Performance, safety, and an understated badge with status attached. There’s a lot to love and the Audi A6 1997-2004 epitomises that. But that model is getting on now and problems are occurring. Let’s take a closer look. As the successor to the Audi 100, the A6 had its first run between 1994-1997. But it’s the second generation from 1997 to 2004 that really turned heads. Trading in the traditional Audi boxiness for modern, aerodynamic, fast-backed styling, the A6 was marketed alongside executive brands such as the Mercedes E Class and BMW 5 Series. Buoyed by listings in Car & Driver magazine’s ‘Ten Best’ list for 2000 and 2001, a facelift model was introduced in 2002. 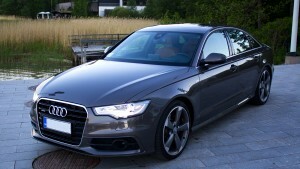 Numerous models of the Audi A6 were produced, with a variety of engine configurations. The closest thing to commonality across the range is that most A6s are available as front-wheel drives, although the Torsen four-wheel drive system is also available in Quattro models. Models include the standard C5 saloon and Avant, the Allroad Quattro, the high performance S6, and the ultra-high performance R6. Audi focused the bulk of its engine development on 30-valve 2.0 and 2.4 litre V6 engines, correctly anticipating these as bestsellers. However, 22 engine variations were distributed worldwide. As the most common engines, the 2.0 litre applied 129bhp to reach 0-60 in 10.5 seconds, while the 2.4 litre engine lent 162bhp to reach 0-60 in 9.1 seconds. The A6 initially featured a choice between 5-speed manual and triptronic transmissions. As part of the 2002 facelift, a continuously variable transmission was introduced to most front-wheel drive models, although the popular 2.0 was excluded from this development. With so many models, engines, and transmission systems, it’s not surprising to see a variety of problems as the second-generation A6 ages. However, the most common problem concerns Triptronic gearboxes failing at 60,000 miles. At £2,000 to replace, and numerous reports of A6s being at the mechanics for months without resolution, this is a formerly great car with one major flaw! There’s a lot to be said for a car that’s enjoyed such a prestigious past. However, all cars have their weak points as they age. If you’ve enjoyed your A6, but triptronic problems are beginning to show, you may be better off scrapping the car than spending a fortune, waiting an age, and diminishing your chance of a lucrative resale. If you need to scrap your Audi A6, contact Scrap Car Kings today.